Configure the dhcpd and inetd service. 07-Feb-2012: removed TCP wrapper reference. 04-Aug-2012: upgraded to Arch 2012 installer. 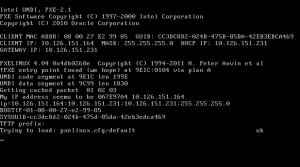 dhcp – A DHCP server, client, and relay agent. syslinux – Collection of boot loaders that boot from FAT, ext2/3/4 and btrfs filesystems, from CDs and via PXE. tftp-hpa – Official tftp server. dnsmasq – Intergrated dhcp, dns and tftp server (instead of 1 and 4). There are two ways to do this. First I will show the ISC dhcpd plus tftp-hpa solution. The second solution is based on dnsmasq. Both solutions can benefit from the availibility of a nfs server, so set that up first. After this, restart the dhcpd and inetd daemons. Most menus are in /tftpboot/pxelinux.cfg. We use menus with an include file that is used by most menus, and complete it with a nice background image. The directory /tftpboot acts as the root directory of the tftp server, so if in a menu file you see /vesamenu.c32 then in reality this is /tftpboot/vesamenu.c32. # homsrv.wpl.ym network boot menu system. 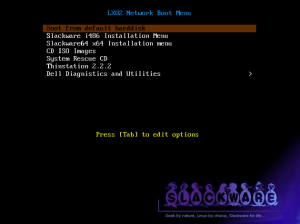 For this you need to have a copy (mirror) of the official Slackware distribution on your server. In this example I assume slackware 14.0 32 bit, so use the slackware-14.0 as base directory. Create a directory /tftpboot/slackware-14.0 on your server. The cd into the distribution, for example cd /mnt/mirror/slackware-14.0. 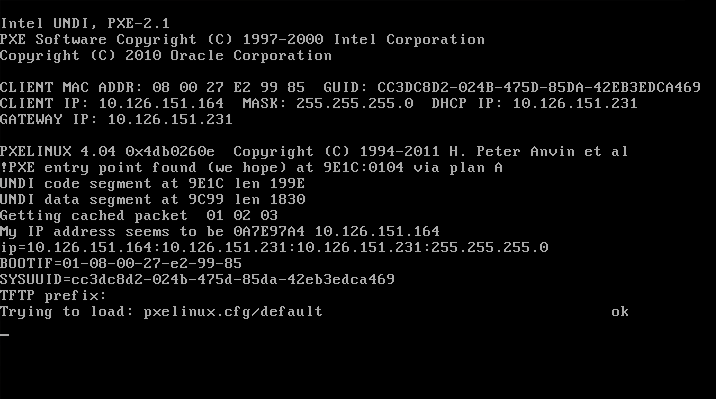 Then copy isolinux/f2.txt isolinux/initrd.img and message.txt to /tftpboot/slackware-14.0. Next do a cp -a kernels /tftpboot/slackware-14.0. Now you have a menu entry for a SMP and non-SMP kernel. In the Syslinux menu paragraph we had already created an entry to this slackware.conf file. You can now do a netboot and start the installer. Because the installer already has a network connection, when you need to enter the location for your source package, use the NFS option. Then point to the path which you have setup with the /etc/exports file to the packages directory of the Slackware distribution.